Lest you think all of December was nothing but joy and lightness I feel it only fair to share some of those fun menopausal family moments too. There were a few times where I had to work to find something delightful about the day, but you know, I did truly find good about each day. I found myself focusing on the happy, positive items which made my life seem better and which made me feel happier. The experiment was a success! My absolute favorite part of the month? Coloring the countdown to Christmas pictures, I am so doing that again next year. Onto real life moments that may very well make you feel better about your own month! Or at least give you a laugh. E yelling over and over again “I’m bored, I’m bored, I’m bored” at the hotel in Flagstaff. I had left the afternoon open to play in the snow or take a hike. There was no snow and it was too cold and windy to want to hike. I didn’t have a plan B. We ended up having an early dinner and watching “Christmas Vacation” in the hotel room. 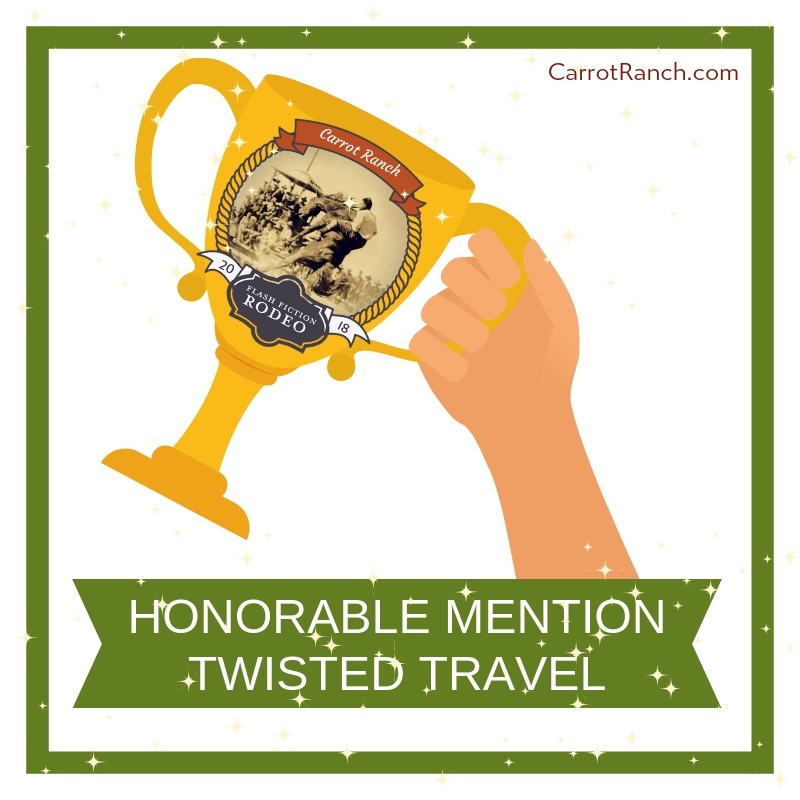 I seriously thought we should skip the trip next year but was soundly voted down by both child and husband which kind of surprised me. I thought I was the only one who really wanted to spend time in Flagstaff but apparently I was wrong. My son forgot to give two of his teacher’s their Christmas presents, even though every single morning for the entire week we talked about it right before he left for school. So Friday afternoon when he came home with two undelivered gifts we headed right back to the school (the school is a 5 min walk from our house). Luckily we found both teachers still in their classrooms, whew. As we were walking out the door for “The Nutcracker” I looked at the tickets and realized the show was at the Tucson Music Hall not Centennial Hall as I thought. We knew where Centennial Hall was and where to park for that. No clue for the Music Hall. 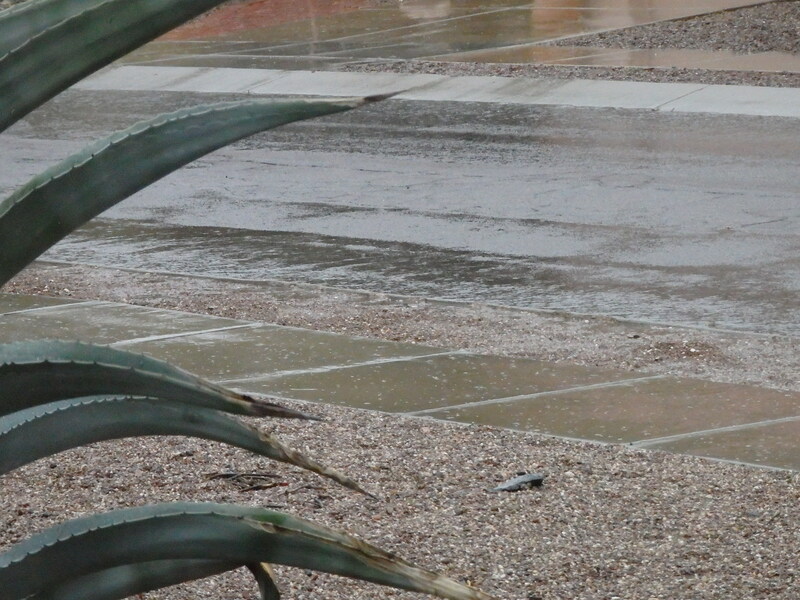 A quick google told us it was near the Tucson Convention Center which we sort of knew the location of. We only had to make one U turn and got there in plenty of time but it was a near miss. Another almost disaster? I came perilously close to dropping the yule log cake while trying to re-box it after taking a photo for the blog. I had to meet with my son’s teacher because of two separate incidents. One involved “the swear word, the F—word” used on the computer. Yes I swear in front of my son but I thought I had made it clear that I was an adult and he was a kid and he couldn’t. Very embarrassing. 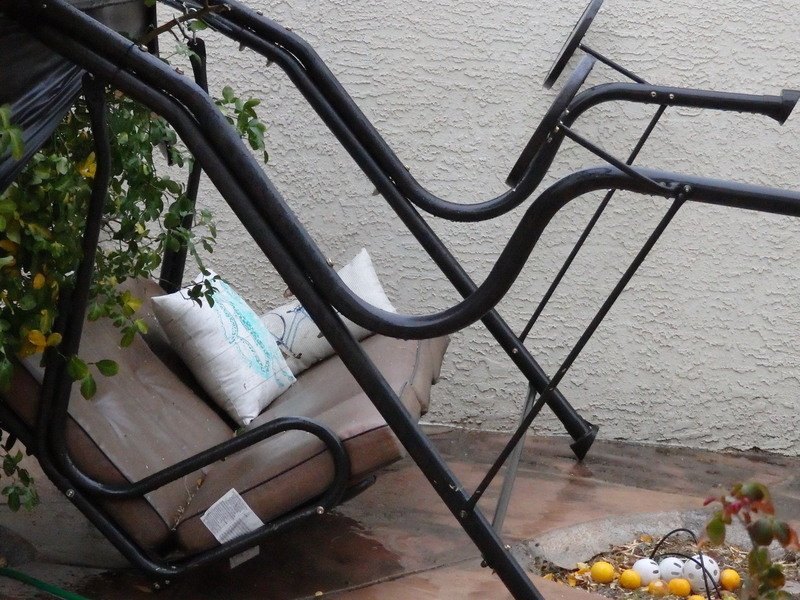 Yes, it was some wind! Our Christmas tree was a bit shorter than normal this year and my husband didn’t trim the branches from the bottom to help it look bigger. Yes it looked great but for the person who had to put water in the tree stand twice a day (that would be me) it was a pain. So there you have it, delight tempered by reality. So I don’t typically plan anything, but this year we are going to a hockey game! Tucson has a new minor league team this year, ‘The Roadrunners’. Um, puck drop? face off? (what do you call the start of a hockey game?) is at 6:00p. I don’t know if I will make it to midnight but at least this year I am getting out of the house for part of the evening. How delightful is that! 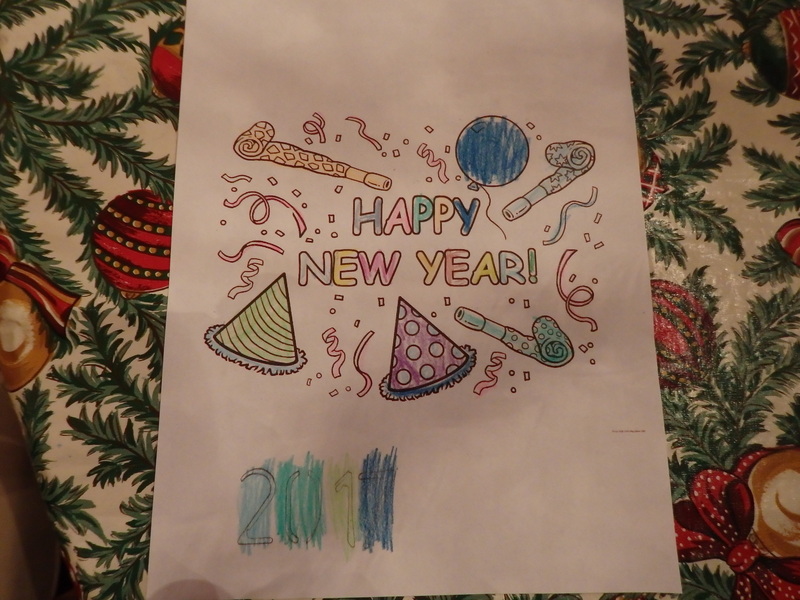 One last coloring project for 2016, my son and I each colored a picture for the New Year. A few weeks ago my husband mentioned that the Air Force Academy was playing in the Arizona Bowl here in Tucson. A 3:30p kickoff, not too late and not so early as to have to worry about broiling in the sun. I thought tickets would be a good stocking stuffer for my husband but for a minor bowl game prices were rather steep. I talked to my husband about it and we decided to wait and see if tickets would be available through Davis-Monthan Air Force base at a cheaper price. Turns out we actually scored free tickets through the base and I am quite looking forward to cheering for my branch of service as well as cheering for saving money! Today I am happy for a little oasis of calm before a very busy few days begin. The skies are cloudy lending a wintry feel, if not temperature, to the day. I have promised my son hot cocoa for 3:00p snack. Right now though I can simply stare out the window at the clouds and breathe. Doing absolutely nothing can be the most delightful thing of all! Today I am thankful I kept a promise to my son. I told him we would have a sleepover one night in our family room next to the Christmas tree. That night was last night. We pulled open the lumpy, uncomfortable sofa bed, piled on blankets, stuffed animals and pillows and read a bunch of Christmas stories. We turned out all the lights except those on the tree and curled up together whispering long past our bedtime. Am I tired and does my back hurt today? Yes. But my heart is happy. Today I am thankful we celebrate the whole 12 days of Christmas, which actually start on Christmas Day! It seems a waste to me to spend a month or more preparing for just one or two days of celebrating. So I have embraced the whole 12 days. For each day there is a small gift or an activity of some sort. The gift or tag with the activity written on the back are hidden each day for my son to find. Hunting for the gift/tag is part of the fun. We also have a Harry and David treat box with a little something for each day that the three of us share. Most of the days are kept simple. Today is “Thank you” note day, a package of blank notes the gift for my son along with a trip to the local frozen yogurt place after we finish writing our thank you’s. It is delightful to still have so much to look forward to these next nine days! I hope you can find small ways to continue your holiday fun! Boxing Day you ask? I have heard two different explanations of the name. 1. The day after Christmas was when the churches opened up the boxes used to collect money for the poor and distributed it to the needy. 2. In the days of the big manor houses and estates the servants worked Christmas Day and had the 26th off instead. On this day the owners of the estates gave the servants their Christmas Boxes (i.e. presents). So the 26th was the holiday for the poor and servant classes. So in my world today is another holiday! We will play games and eat too much (again) and be lazy. I’ll have crumpets and tea later as well as Cornish Pasties for dinner. We’ll have Christmas Crackers at dinner as well. (Crackers being a small wrapped tube you pull open with a pop and contains a small gift, paper crown and riddle or joke.) I may even work some British words into my conversations today! Cheerio my good chaps, I am off to have a cuppa! The last count down picture I colored for my son. Of course I felt bad about not placing an order with her but she said it was okay: “She just wanted me to be happy!” How incredibly nice was that? And I have decided to go back to that Coldstone and happily order a small cake for Epiphany. There is nothing better than a business that wants happy customers. 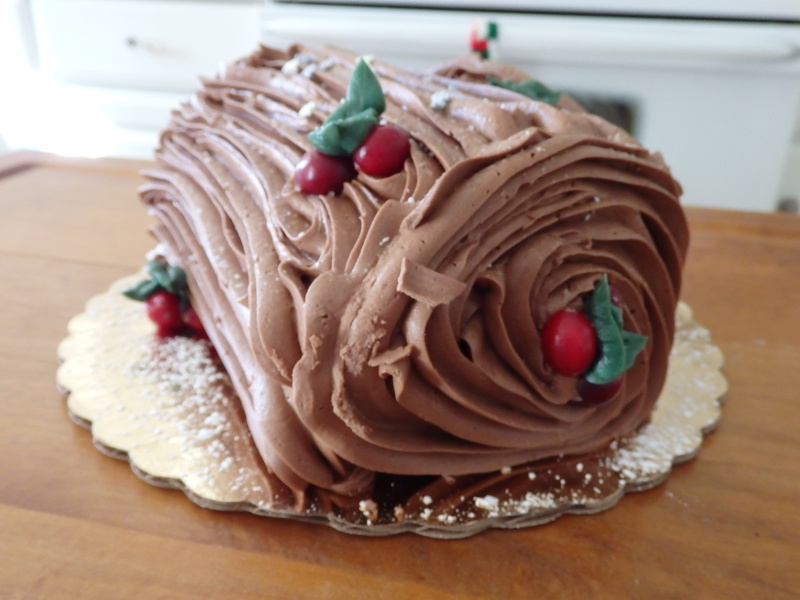 Chocolate on chocolate yule log cake. Should I add a little more snow? Ah, Christmas Eve and today I have a whole list of things filling me with delight! Everything is done: cards and packages mailed, cookie boxes delivered to the neighbors, house cleaned and decorated, meals planned and shopped for, gifts wrapped. And that means today can be slow and focused on anticipation and waiting. My husband took our son and dog to the park giving me a chance to write this up, get in a few steps on the treadmill and enjoy a little pocket of quiet time. Mugs of hot cocoa and watching a “Charlie Brown Christmas” after lunch. That feeling of peace I get every year at church when we sing “Silent Night” by candlelight. 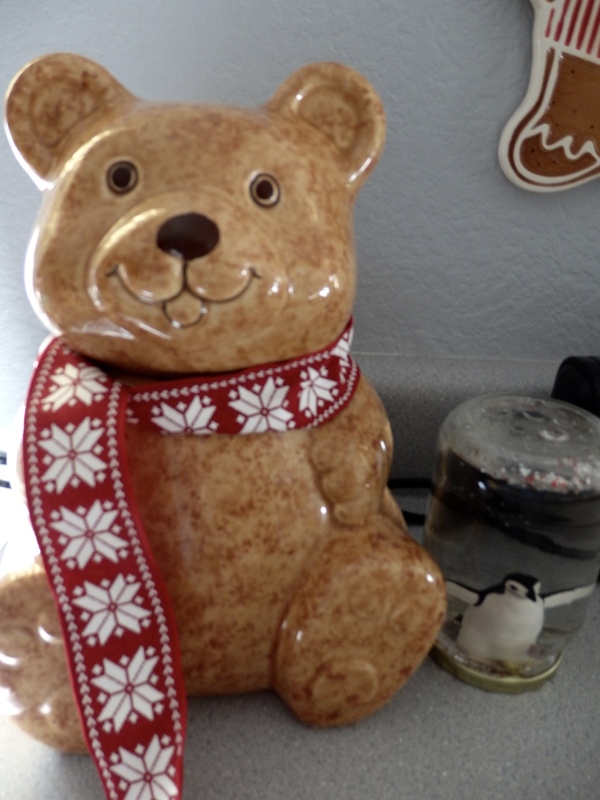 My cookie jar dressed for the holidays and hanging with his penguin homemade snow globe friend. Wishing the whole world PEACE AND JOY this holiday season. 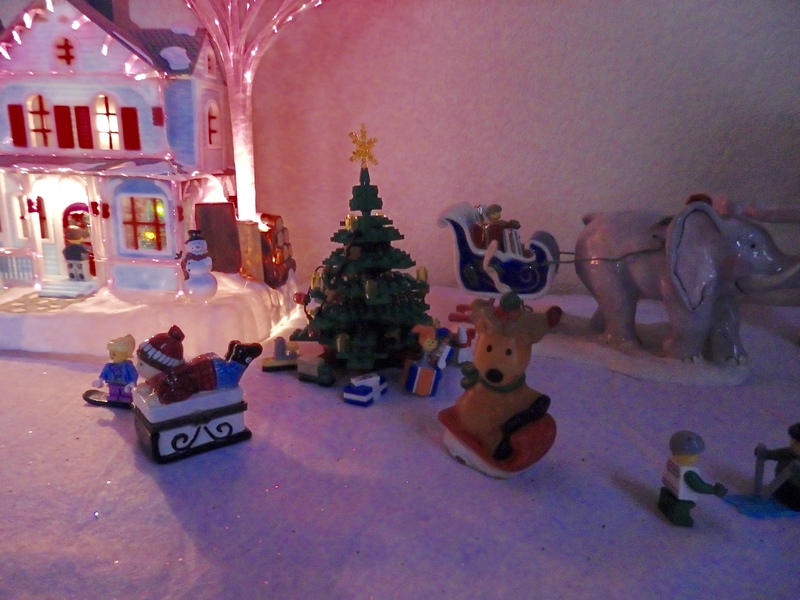 Today I am grateful for something silly: my mismatched no sense of proportion or cohesion winter village. I have no idea how it even got started, just some assorted buildings that one year I decided to put on the sideboard and the village was born. Because I love the movie “A Christmas Story” my friend sent me this little figurine of Flick with his tongue stuck to the pole. He suits the village perfectly. 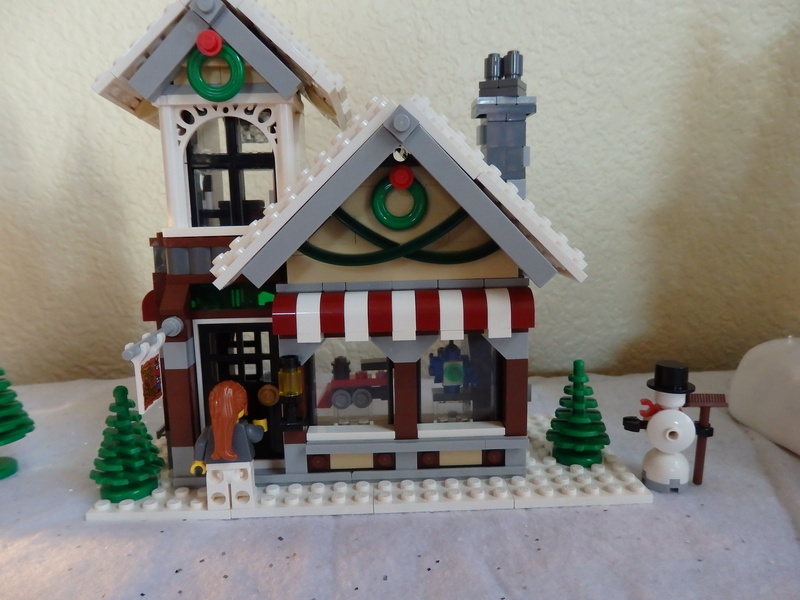 Our first new building addition in a long time, the Lego Toy Shoppe. Why yes, that is an elephant pulling a sleigh through the village. I have no idea why this display makes me so happy but it does and I am always grateful for an involuntary grin of happiness.